Welcome to this weeks SOS. 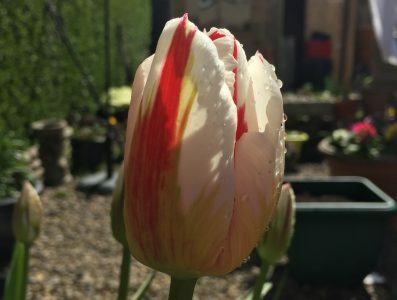 Been a busy week at work this week so garden action has been limited but as always with this time of year there is always new things in the garden bursting through. We had 3 days of constant rain at the beginning of the week but the garden seems to have taken it in it’s stride. I have been working in the Garden today and have been potting some Pelargonias and Dahlia’s and making full use of the new potting bench. I have also been planning my shed move which I will be doing the last week of April when I am on holiday for a week During that week I will also be visiting the RBGE gardens at Benmore near Dunoon and the Dawyck Botanical gardens new Peebles. No doubt 1 or 2 plants will be purchased then. I am that pleased with my potting bench I had to put another photo of my new potting bench again. I have been using it the full. mist of the pots include cuttings of Sedums and a few small Dahlia tubers. I found the Libby’s corned beef wooden box in an Antiques/Thrift shop a couple of weeks ago. My home town seems to be getting gentrified a bit since we voted s Conservative MP and there are lots of antique shops springing up which is not a bad thing but sort of goes against my non practising working class socialist beliefs. This is sedum plant is one of the best performing plants I have got at the moment just keeps growing. By the looks of it this is going to be one of the best specimens I have this year. isn’t nature wonderful and as they say small is beautiful. I have not got the biggest garden so I have a lot of Alpines in pots. This is in a half terracotta pot and it is thriving. The colours are so vibrant and vivid as are many colours this time of the year. Looking forward to see it flower. I bought 18 plug plant lavenders from J Parkers this year. I know J Parkers have mixed reviews but you pay what you get for with them. I am going to bring these on to the middle of May and plant them in front of my “Alpine Shelf” pretty compact, There are 2 varieties Fathead, Kew Red and Papillion. I think the Bees are going to have a good summer. Always had a soft spot for Pelargoniums to thought I would have a go at growing them this year. As I am taking it seriously I have bought 3 varieties from one of the premier Pelargonium nurseries Fibrex https://www.fibrex.co.uk/. I have bought 3 varieties Cherry Orchard, Lord Bute and Old Spice. I received the parcel this morning and was delighted to see that 95% of the packaging was biodegradable. I have like everyone else become plastic aware this year after Blue Planet. It saddens me to see row after row of plastic when you go into garden centres. I have a particular problem with the way compost, mulch and gravel are packed. You not only see them in Garden Centres but outside Supermarkets by the pallet load. It is time that they come up with a more environmentally solution and the sooner the better. Some of the daffs took a bit of a battering this week with the rain but it is good to see that soon a couple of Sedums will be taking this place. In this picture we have Sedum Autumn Joy and Sedum Red Cauli, There is also some St Johns Wort in the left corner. I donlt know what to think of St Johns Wort as a plant TBH. It was pretty drab last year so it must do much do better. That is heartening to see plants wrapped in newspapers! Although readership of newspapers is now so low I wonder if there will be a supply problem? I have been surprised to see how quickly the daffodils have gone over. It seems as though they were really late, but have run to seed really quickly. Many of my daffs are yet to open. It’s a bit chillier up in the Chilterm hills. It was great to be in your neck of the woods this week, even in the snow! The tide is turning against the Plastic age, eh? Bout time too. Yes I am lucky to live in a wonderful county…don’t tell everyone though we don’t want it to become Cornwall. Yes bout time about the plastic revolution…..been racking my brains about how to package compost and gravel more environmentally friendly….perhaps reusable bags…. My daffs are just appearing here in Wiltshire too but everything is coming in quickly now isn’t it? I love that sedum! Such a pretty colour. I also have lavender Papillon but the Beast 2 has been there (also because of the wet soil around it). I have a half rotten, I saved the other for the moment and I hope the second will recover because it’s a fragile plant … I’m waiting to see your lavender bloom, especially the 2 other. Mail order pelargoniums?! They must be something special. I use them for cover crops, but I really like the two that I have been growing for most of my life. Oh my; their single zonals look something like my old school pelargoniums. Thank you for forwarding this. You have inspired me to order some pelargoniums from Fibrex – I knew they were one of the best and good to hear they use biodegradable packaging. Still loving that bench. I have the same niggles about compost bags. Every year (& I’m having that moment at this particular moment), I dither about buying a bulk order, the bag of which is returnable. It’s not only the big cost all at once, but that bag sitting at the curb until I empty it. And every year, I buy one, despite all of that. Much better than all those plastic bags. Unless I’m doing something big and so buying bulk bags of compost, I use coir, bought in bales about a foot square and 6″ thick. Just add water to get 70-75 litres of compost. My current source (Fertile Fibre) doesn’t even wrap individual bales in plastic but, rather, they come in 4-packs carefully wrapped in, OK, a sheet of polythene and some sticky tape but it’s less overall and is a sheet I can re-purpose. Some plastic is unavoidable at the moment; what matters is that we limit our use as much as possible. I’ve never understood Parkers getting mixed reviews. I’ve bought bulbs, young plug plants and larger plants from them many times and have never been disappointed. Some people expect a 12 foot tall tree for 50p!